bauermech wrote: In the manual (page 93) it shows how two different brands need a different "module number". In their exmple a "1" is placed in front of the channel number for the KRG-1 gyro. Maybe Futuba requires a different number as well? The GWS works quite well... I haven't tried the KRG or Futuba models, so this is simply a guess. "However, when I got the SetZero ... READ ... Correct the two ankle servos to ^121 so the bot is standing upright correctly ... WRITE ... then ReSet the bot ... it goes back to the downhill skier position again ??? " Still, I'm having other problems ... the bot falls back when turned ON ... once fully stiff, I can stand it up and it's straight as an arrow ... but when I try sittting or other routines the bot falls over during the "return" part of the routine ... basically, it seems the routines are going from some other "zero" point than what is stored in the bot ??? On top of that, I can do 2-3 REMOCON routines then the bot stops listening to the IR Remote ??? Why would the bot not work w/the remote when the gyro's are attached ??? Hope this helps, gyros are amazing devices once you've got them working right. Last edited by CaptKill4Fun on Sun Aug 06, 2006 7:05 am, edited 1 time in total. I have used Matts code as well and found that with one or both gyros on there is no servo interaction.All the gyro lights show an input and reaction but no RB movement.I will keep on it but just wondered if any one else has tried it yet. Hmmmm. I don't know what would be wrong... H3dude goes into great detail on his site. If neither work, then there's something else wrong... not the code. thanks for the advise.unfortunatly rb stands there with no gyro reaction at all ?? Congrats on your success, I also have the issue that my robot is less stable from side to side than front to bad, which is kind of odd given the fact that he should have more to balance on in that axis (two feet in a row vs one front to back). I was thinking perhaps having him bend a knee if he is pushed in a direction so that he does tip onto the lip of his foot? Is there way to declare two gyros for a single servo or, what i would presume, does the second decleration of one replace the first? Maybe if one were to map the accelerometer during a time that the robot could be tipping from side to side they could effectively switch between several gyro setons. So say that your 3-axis accelerometer detects a change in the y direction (side to side), this could potentially run a code that said the side to side gyro now has control over bend in the legs instead of the other gyro and now instead of tipping on a foot the robot would just bend there, and once he was back to a neutral position the accelerometer could trigger the neutral gyro position and reinitialize the front/back gyro to have the slight bend in the legs. I was just thinking that one could bend one of the knees so that instead of the RN tiping over its cg would lower, just slightly, and then come back to center. As for the hips, i dont think you really need those unless you are going for a much larger degree of freedom, but again, i could e wrong. I have added the two rotational dof and it raises the robot up, but still he will tip at the foot, granted if he takes the time to rotate outwards he is muh more stable, but that takes time, and most likely that would mean the gain is so high that he would be jittery. Once my robot is back together, or if i can test it on another, ill let you know how bending at the knee (using all three servos per knee) works out for me. as you can see (I hope) I have removed the cover of one Gyro to enable it to fit inside the chest of the RN. I have also added a thin plywood plate to support/glue the gyro in place on. The above codes is working fine but as I see it the RN will never be able to fully utilize the use of Gyros! 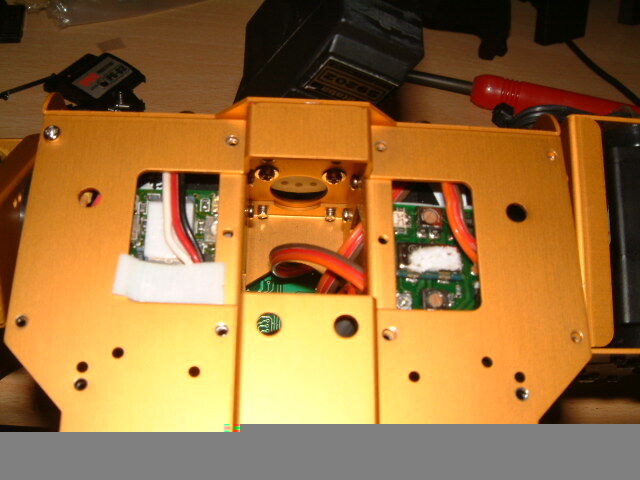 It seems that he is too wobbly in his joins and perhaps the controller board is not fully developed to handle gyros? I think it will be necessary to turn the gyro off before each move and then turn it back on after the move? Any one has other thoughts about this? Got to agree with you on this one. I have certainly found you can't leave them on all the time. I have the forward backward gyro working a treat. The robot does have a tick (you can here the motors twitch but no visible movement.) and it does get the tremors as he settles but it does settle within sub seconds. I find it much better if the zero position is slightly weight forward or backward as it settle much better and does not try to activly maintain an absolout balance point. This is why our legs have knee caps so we can lock our legs, otherwise we would need to rock backward and forwards. My opinion however. The servo sensitivity cannot be adjusted enough. I estimate that the arms need some 30 degrees of movement in response to a poke. You cannot get that. You need at least PI or PID (proportional, integral, differential) control to stop the jitters all together. There is a difference between maintaining balance and handing disturbance (the chest poke) A combo of accelerometer to manage servo gain is what the pro's use with a stateful response to disturbance. eg If I were to push you, you would only resist with your body weight to a point and then you would step back. If you were hit with a shock force, you would propably lunge and drop you center of gravity. All these thing we cannot do with the robobasic. There seems to be a difference of opinion on which leg servos and which direction to use. Some people use only 2 DOF and some use 3 DOF. Some reverse the direction of the knee servo too. Steps off soapbox. Thanks for listening. I have managed to fit BOTH gyros into the chest area.They are actually fixed to the shoulder servos with strong double sided tape.The wiring is then routed over his right shoulder under the armour again so no sign of them.Be careful as i had some sharp edges under there but a dremel later and all is smooth.Just another small step for me but thought i would share it.Cheers..
OOops ! Sorry a double post. The links for pic is below.Maybe admin can delete this one for me. MATT !!!! Last edited by rep001 on Wed Aug 23, 2006 11:35 pm, edited 1 time in total.